The Church of Sant' Agostino (St. Augustine), on Via Francesco Raimondi, was built in the fourteenth century in a Romanesque Gothic architectural style that is locally known as "Chiaramonte Gothic." The construction of the church was financed mostly by a powerful Sicilian baronial family, the La Grua, whose coat of arms is visible on the exterior. Most of the interior was reconstructed in the Baroque style in later centuries. The facade, rose window and main entrance are typically medieval, as is the cloister off to the left side of the church. This cloister is built in the Catalan Gothic style and surrounds a central fountain. The "chapterhouse" located at a corner of the cloister preserves some original thirteenth century features. Embedded into the wall of the stairs leading from the church's side entrance is an ancient Roman tomb. Sant' Agostino is located near the Capo Market, a large street market that captures the flavor of Palermo's Saracen past. Capo is a blend of general confusion and a jumble of vendors' stalls, winding toward the old gate (Porta Carini) of what used to be the city wall. The original market is not the part near Sant' Agostino, but the section where one finds meat, fish and produce vendors. Sant' Agostino is worth a visit, but the Church of San Francesco, built in the same style, better preserves its medieval look because it has suffered fewer modifications over the centuries. Except for the Steri, Castello al Mare ("Castle-by-the-Sea") is the only true castle in Palermo proper, and not much of it remains. Castellaccio, near Monreale, is actually better preserved, but Castello al Mare is worth a quick visit if you're a real castle lover. Sadly, the only parts of this fortress standing today are a few walls and stubby towers, and a dry ditch that was the moat. The castle was built during the Norman era on what was then the coast (it's now a few hundred meters inland) and modified over the centuries. It was destroyed almost entirely in 1860 when zealous Palermitans, taking advantage of martial law, collapsed its picturesque walls and stole its bricks for their own use. Hidden from general view, Castello al Mare is located near Via Filippo Patti off Via Francesco Crispi opposite Piazza 13 Vittime, reached from Via Cavour. Read more about Castello al Mare. Located next to San Filippo Neri Church in Piazza Olivella, between the main Post Office (on Via Roma) and the Teatro Massimo, the Salinas Archeological Museum is housed in several buildings, one of which dates from the thirteenth century (with an arched window visible across the courtyard near the museum's entrance). The complex houses important Sicilian finds from the Phoenician, Punic, Greek, Roman and Saracen periods, and also several noteworthy items from Egypt and elsewhere. 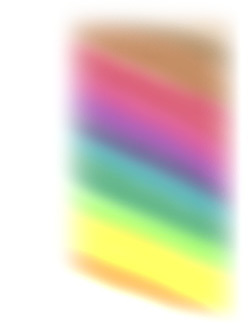 Don't let the condition of some of the galleries dissuade you; this museum is well worth a visit. Of particular interest are the large mosaic pavements taken from the Roman structures discovered in Piazza Vittoria, the lions' heads from the Greek temple at Himera, the sarcophagi from the Villabate area, sundry pottery and coins, and the Palermo Stone. The last was discovered in Egypt in the nineteenth century in an expedition sponsored by the Whitaker family (Anglo-Palermitan wine merchants) and destined for the British Museum but left in Palermo for bureaucratic reasons. Resembling the Rosetta Stone, the Palermo Stone bears carved hieroglyphics describing a long series of pharaohs. Indeed, it is one of our most important records of this kind, and helped to form a framework of Egyptian dynastic history. Located in Piazza Verdi at the corner of Via Maqueda and Via Cavour, the Teatro Massimo was one of the world's largest theatre complexes when construction was begun in 1895 according to designs by Giambattista and Ernesto Basile. The vast structure was nearly complete by 1897 and is said to be haunted by the ghost of a nun who lived in the convent that once stood on this location. Its main gallery is about the same size as that of La Scala (Milan). The Teatro Massimo is one of Italy's most famous opera houses, and a monument to the Neo Classical movement. To moviegoers, the most famous performance associated with the Teatro Massimo took place not on the theatre's stage but on its steps, during the last scene of The Godfather Part III, filmed here in 1990. 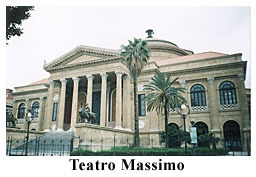 The Teatro Massimo web site is linked from our Links Page.